FTA Aconcagua Feb 2012 - SUMMITS! FTA team from Dec 2010 on top. We'll post the 2012 team pics shortly! 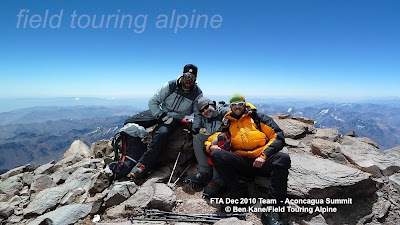 Ben wrote in from Plaza Argentina to report that they had a successful summit bid and that the entire team is back in base camp safe and sound! Ben, Cameron, Stuart, Melvin and Er Jun topped out on the 17th at 2pm on cold and windy but clear day. Shaun and Jaclyn made a great effort as well and reached a high point at the start of the traverse above Independencia Hut. They returned to Colera camp, spent the night amid the very high winds and in the morning descended to Argentina. Ben said that the winds were strong enough that just packing up the tents in the morning took a great deal of effort and especially to avoid and cold injuries. They should be heading out today and hope to be back in Mendoza for well earned hotel beds, showers, steak suppers and wine tours! We'll look forward to seeing the pics and hearing a full report when they are back in town. 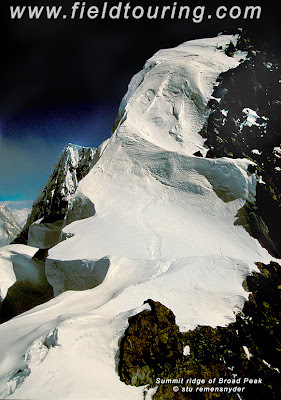 Next up for Ben will be Broad Peak so if you fancy a trip to Pakistan and a great 8000m peak let us know! Ben dropped us a note before the team left base camp a few days back and everyone was doing well and looking forward to the summit push. By this time they have set camps in C1 and C2 and will be trying to make a summit bid. The plan included a possible summit bid today. Unfortunately the predicted winds are quite high for the 16th to 19th and it may be impossible to make a bid during this time. Ben knew before leaving base camp that they might well have to retreat to C1 and hope for a second chance. They do have some spare days to wait out the winds and hope for a dash to the top on 20 or 21. 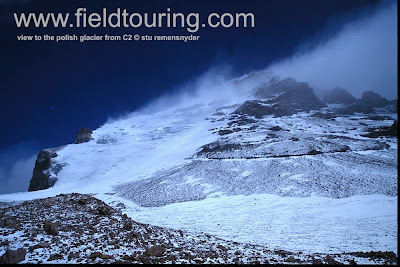 The image in this dispatch is one taken some years ago but gives you a good feel for the nature of high winds on Aconcagua. The winds can be strong enough to flatten tents and in such conditions the only option is top hunker down or head down. When the winds come up they seem to usually sit for 3-4 days and then are followed by nice calm periods. We'll post any news we have over the next week but it may not be until they descend to Argentina or Mulas on 21st or 22nd that we hear from them. 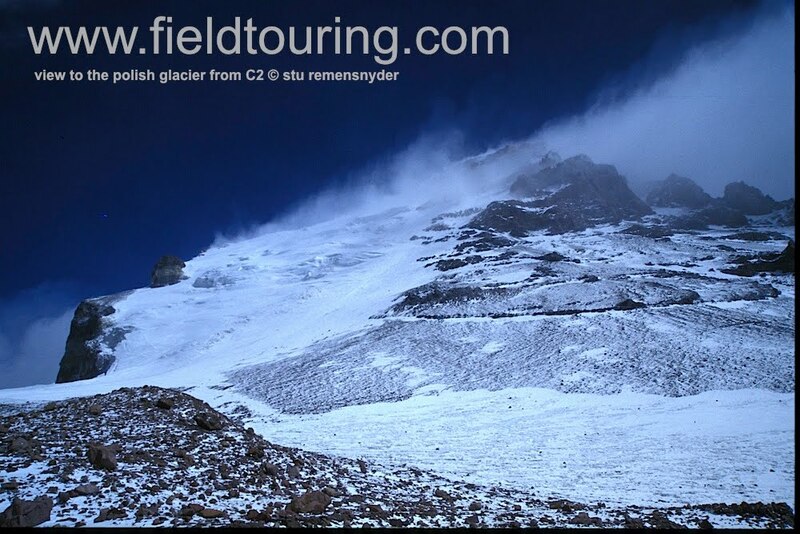 We have a second small private February group climbing the normal route and they are in Penitentes acclimatizing today. They will make final gear prep and will be heading to Confluencia tomorrow. We are always happy to accommodate small private groups so let us know if you have a special date or route and we'll set you up with a trip! We are starting to have a good run on our trips to Broad Peak in June and Cho Oyu in September and are looking for great team members to join us for these trips. Our Noshaq trip is filling up fast and if you are not on our mailing list and are interested in climbing the highest peak in Afghanistan let us know! 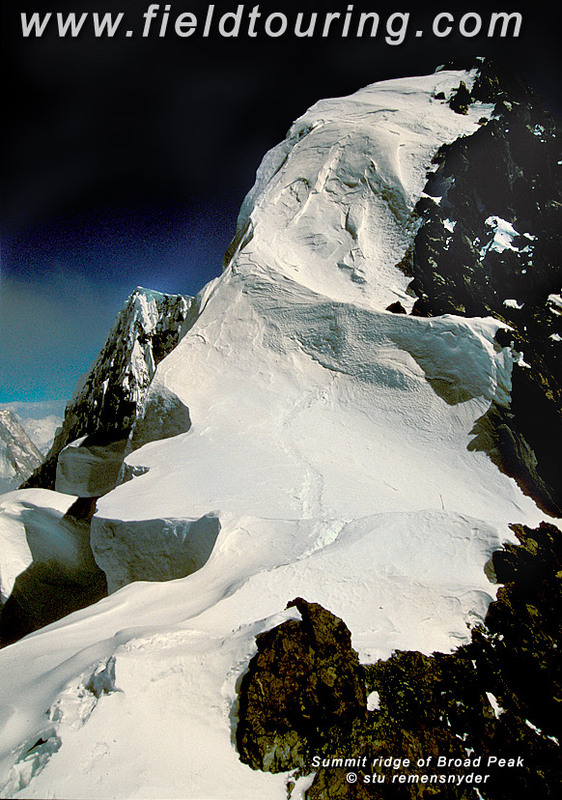 Lots of other trips are coming together including K2, Stok Kangri, Ama Dablam and more so have a look at our trips and let us know where you'd like to go in 2012-13! 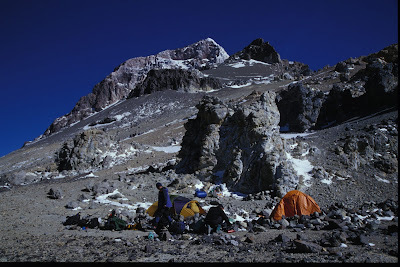 Aconcagua False Polish - team in base camp! FTA Feb 2 Acon Falso update - in BC! Ben has dropped us a note that the team is now in Argentina base camp and have been enjoying a rest day. They hope to make a carry up to camp 1 tomorrow and if everyone is feeling well they will hope to move up to camp 1 on the 10th. A few members are feeling the effects of the altitude after the move from Casa de Piedras up to Plaza Argentina so they will be sure to take the days they need in base camp to have everyone feeling well. It looks like there will be some precipitation but low winds for the next 3-4 days so they should have good weather for establishing high camps. We are keeping our eyes on some high winds predicted for the 15th to 17th or so and hoping this does not materialize.